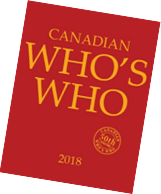 This Database contains Data from the annual publication known as “Canadian Who’s Who”. Copyright in this data belongs to Grey House Publishing Canada. The copyright in this website page set, and in the underlying source HTML files which implement the hypertext features of this website page set is owned by Grey House Publishing Canada. All materials published on this website (including, but not limited to, articles, photographs, images, illustrations, audio clips and video clips, also known as the "Content") are protected by copyright and owned or controlled by Grey House Publishing Canada. You shall abide by all additional copyright notices, information or restrictions contained in any Content accessed through the website. This website is protected by copyright as a collective work and/or compilation, pursuant to Canadian copyright laws, international conventions and other copyright laws. You may not modify, publish, transmit, participate in the transfer or sale of, reproduce, create derivative works from, distribute, perform, display or in any way exploit any of the Content, software, materials or service, in whole or in part.